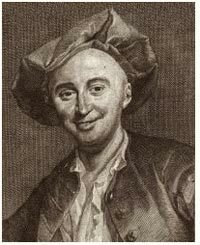 French philosopher, materialist and sensualist, his training in medicine had a decisive influence on his philosophical choices. Student of Boerhaave, he was a leading exponent of the iatro-mechanic tradition. Persecuted for his materialism and atheism, he found refuge in the court of Frederick the Great. Influenced by Glisson and Haller, he asserted the irritability of matter and delineated a descriptive and anti-speculative ethics. 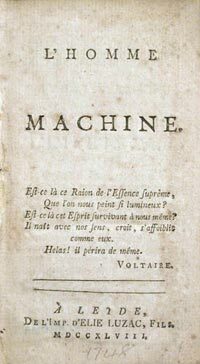 Main works: Histoire naturelle de l'âme (1745); L'Homme machine (1747); L'Homme plante (1748); Anti-Sénèque (1748); Le Système d'Epicure (1750); Discours préliminaire (1750); L'Art de jouir (1751). Bibliography: L. Cohen-Rosenfield, From Beast Machine to Man Machine. Animal Soul in French Letters from Descartes to La Mettrie, New Haven 1941; A. Vartanian, La Mettrie's «L'homme machine», a Study in the origins of an Idea, Princeton, Princeton University Press 1960; H. Kirkinen, Les origines de la conception moderne de l’homme machine, Helsinki, Suomalainen tiedeakatemia 1960; L.G. Crocker, Nature and Culture. Ethical Thought in the French Enlightenment, Baltimore, John Hopkins 1963; A. Thomson, Materialism and society in the Mid-eigtheenth Century: La Mettrie's Discours Préliminaire, Genève, Droz 1981; K.A. Wellman, La Mettrie: Medicine, Philosophy and Enlightenment, Durham, Duke University Press 1992; R.E. Stoddard, Julien Offray de La Mettrie, 1709-1751: a Bibliographical Inventory, Köln, J. Dinter 2000; H. Hecht, Julien Offray de La Mettrie: Ansichten und Einsichten, Berlin, Berliner Wiss.-Verlag 2003. Catalogue d'une très-considérable Bibliothèque En Livres, de Théologie, de Droit, d'Histoire ... Parmi lesquels se trouvent ceux de Feu Monsieur De La Mettrie, Médecin du Roi, & membre de l'Académie Royale des Sciences de Berlin: Lesquels se vendront le 17ème Avril 1752 ... par Jean Neaulme, Berlin, Neaulme 1752, 140 p., in 8°. The sale catalogue lists 2,018 descriptions divided into three classes according to format: in Folio (nos. 1-174), in Quarto (nos. 1-361), in Octavo, in Douze ou moindre formes (nos. 1-1483). These are further articulated in subclasses. The index of names and a summary table of the classification scheme are missing.